The 2008 Beijing Olympics in China will be broadcast on Australian TV and streaming video online by the ABC (Australian Broadcasting Corporation) between September 6-17 2008. 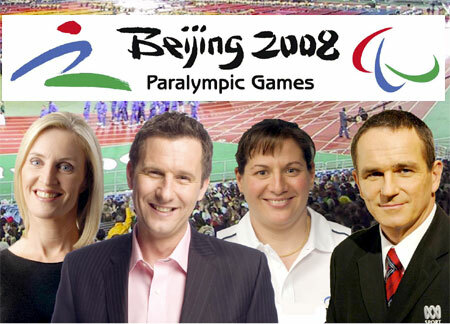 Comedian and TV presenter Adam Hills, Paralympic Gold Medallist Louise Sauvage, and ABC Sport presenters Karen Tighe and Steve Robilliard will present ABC TV’s exclusive coverage of the Paralympic Games Beijing 2008. The team will be in position to bring viewers all the excitement of the Games when they start on Saturday September 6, with the spectacular Opening Ceremony broadcast live from the National Stadium in Beijing. The ABC will broadcast more than 100 hours of the 2008 Beijing Paralympics LIVE on ABC1 and ABC2. At seven‐and‐a‐half hours per day this is the biggest coverage of a Paralympic Games ever worldwide, with a highly experienced team of Paralympian commentators and technical crew who will bring high quality HD coverage of the games to the homes of all Australians. An extensive 13 Page Paralympics TV schedule for ABC1, ABC2, ABC HD and ABC iView is available for download. On the site you will find all the latest news, results and medal tallies from Beijing. The ABC’s team of experienced commentators will report on the results of competition as they unfold. You’ll also find comprehensive athlete profiles, feature stories, image galleries and video. And if that isn’t enough, all the 2008 Beijing Paralympics events will be available for free video replay online at ABC iView. ParalympicSport.TV is a top quality 24/7 television channel broadcasting via the Internet. Free of charge, people all over the world are able to watch live and delayed programming, or see the coverage on demand later. With this channel the International Paralympic Committee (IPC) tries to promote the Paralympic sports and the Paralympic spirit. ParalympicSport.TV allows more people to experience and witness the outstanding sporting performances of athletes with a disability. When Australia sends its largest ever Paralympic team of 170 athletes to compete at the 2008 Beijing Games, ABC TV will be there to bring you all of the excitement. Athletes from every Australian state and territory have earned selection to compete in 13 sports. There are 95 first‐time Paralympians in addition to 75 returning athletes, who have a total of 180 medals to their credit. Having featured at every Paralympic Games since the first summer Games in Rome 1960, Australia’s record is formidable, highlighted by numerous top 10 finishes and capped by its number one ranking on the medal tally at the Sydney Games in 2000. With 908 medals from previous Paralympic competition, the 2008 team could be on the verge of earning Australia its 1000th Paralympic medal in Beijing. My daughter and her partner are both in wheelchairs so I have really been enjoying the ABC2 coverage. The coverage has been excellent and it is good to be able to see so much of the games. They are an inspiration to us all. i love watching the paralympics as all my friends do thanks to abc i get to see the games but for the people who do not have HD are missing out on so much channel 7 broadcasted the normal games so what is the difference for not showing these games they are just as impotant. Channnel Seven often don’t even give the Paralympics a mention on the evening news service let alone give coverage comparible to the able bods!!
? Really Paralympics on US TV? That’s news to me. What is amazing is that these boneheads who run TV Networks feel it’s fine to DISCRIMINATE against a world of outstanding people from all over the world in a country that LIES about being about equality. When will PEOPLE come before ratings and or PROFITS. The Vancouver Paralympics had OVER 1.8 BILLION people watching it. Imagine if the UK, and other areas not showing it like the media of America and show it like they show the Olympics… You know as many hours, and all… With all the bravado and such… I PROMISE that the money will follow the effort put into things. Only no TV network has the BALLS to actually do this. They rather instead show infomercials, and pointless, aimless, hopeless, meaningless TV that at best is mediocre. What people fail to realize is that by NOT showing these fine games the US is in violation of a law passed in 1978… The Amature Sports Act. Look it up. Not to mention we don’t discriminate in this country of ours right? Or do we? Eugenics is one of many things being done to keep people of difference under control… So is FORCED ISOLATION and has to be the worst thing ever done to people by people ever. Today in third world countries we have the largest numbers of people living out of the total world population of 6 to 7 billion. With these third world people about 4.2 to 5.3 Billion have some form or type of disability today. You do the math and figure how much out of the world percentage that is. Now add the modern world’s estimate of 10% of the total world population that has REPORTED having a disability then consider this is not counting the people who get cured, or resolved from the issue they have. Not the elderly, no the poor, not the people who don’t know they have a disability, not the homeless, not the people who refuse to be counted as disabled for any reason. Now, the people of the third world countries only count for the numbers they bring. Nothing else. They get worse treatment than trash or rubish you are about to burn. Not even as good as livestock. So it is no wonder that the world as we know it tries everything it can to keep those in the club, or with characteristics down. Do not dis my ABILITIES.